Students on the UMass Amherst campus. It wasn’t too long ago, six years to be exact, I was reading, in this very newspaper, about people complaining that the University of Massachusetts’ flagship campus in Amherst was a second-tier state school, nowhere close to the Michigans and the North Carolinas of this world. 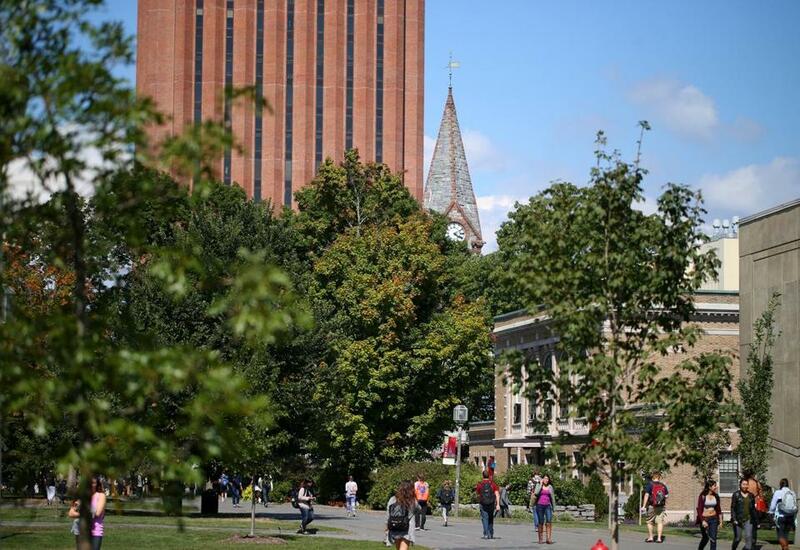 The rap on UMass was that its facilities and academic standards were second-rate and its supposed undesirability was evident in a lack of out-of-state students lining up to apply. 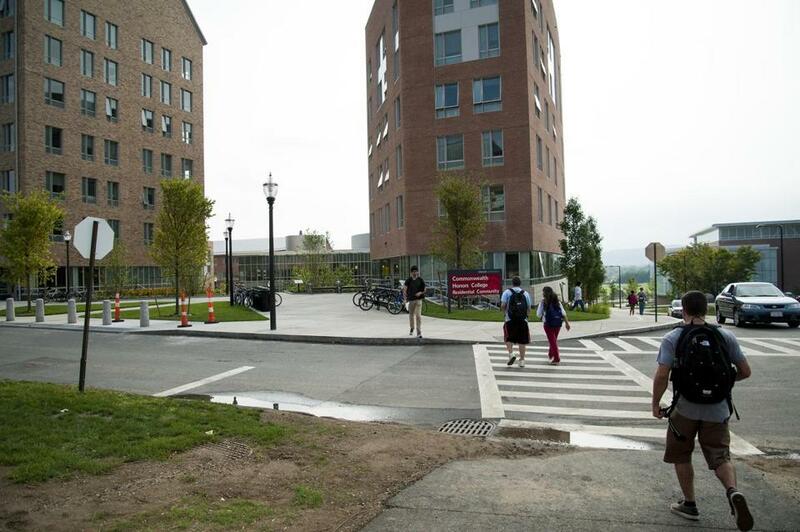 Now the Pioneer Institute is out with a report saying a more academically rigorous UMass is spending too much money on nice new buildings and letting in too many out-of-state students. Like I said, UMass can’t win. Marty Meehan, the UMass president, is none too pleased with the Pioneer Institute report. The Pioneer Institute recommended that UMass cap on the number of out-of-state students it admits, but Meehan isn’t buying it. Meehan also disputed the idea that taking more out-of-state students is somehow cheating Massachusetts students. Besides, he said, the out-of-state students, who pay about $43,000 a year to go to UMass Amherst, are subsidizing in-state students, who pay about $26,000. The Pioneer Institute found that across the five-campus UMass system, out of state enrollment increased by 84 percent between 2008 and 2014. In that same period, in-state enrollment grew by 19 percent. But Meehan says UMass Amherst has a good balance, with 76 percent of undergrads being from Massachusetts. Meehan won’t apologize for building up the Amherst campus. A view of UMass Amherst’s Commonwealth Honors College for high-achieving students. While the Pioneer Institute is seen as a frequent critic of the public sector and a champion of the private sector, Meehan said his interactions with the private sector suggest it supports the UMass strategy and wouldn’t support the caution advised by the Pioneer Institute’s report. One part of the Pioneer Institute’s report, suggesting that UMass’s growth could pose an existential threat to private colleges and universities, was especially galling to Meehan. As for the Pioneer Institute’s claim that UMass is not fulfilling its primary purpose in educating Massachusetts residents, Meehan waved a dismissive hand. If you get decent grades at community college, you’re guaranteed admittance into UMass. If Meehan sounds a tad overly defensive, he has a right to be. He is the first undergrad alumnus of the UMass system to serve as president. UMass has been demeaned for generations, even as it has provided a good, affordable education. It struggles for status and attention in a state and a culture where private universities, from Harvard to Boston College, gobble up the available oxygen. It doesn’t receive the legislative support that is taken for granted by public universities in most states. So out-of-state students are needed, if only to have them pay a bigger share. But it isn’t merely about money. This week, Meehan will attend commencement at UMass Boston, where students from 150 countries will graduate. Kevin Cullen is a Globe columnist. He can be reached at cullen@globe.com. Follow him on Twitter@GlobeCullen.